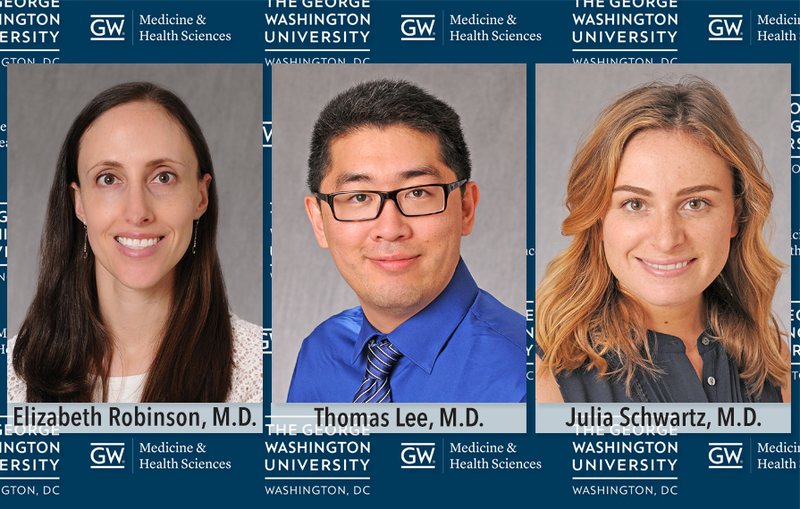 Residents in the George Washington University (GW) School of Medicine and Health Sciences Department of Dermatology residency program are quickly becoming a force to be reckoned with, impressing not only through their clinical work, but also research; the department is generating an impressive list of awards to prove it. “My philosophy was to hit the ground running, and escalate the program to the national stage as quickly as possible,” said Adam Friedman, M.D., associate professor of dermatology and director of the residency program. The GW Department of Dermatology residency program, which was relaunched in 2015, is unique, Friedman added, because residents, in addition to their clinical work, are formally instructed in the art of presentation. Over the course of their time in the program, they give lectures to each other, to the department, and even present nationally, as is the case with the department’s recent award winners. “My hope is that by engaging residents, they will walk out [at the end of the program] knowing how to present and network and be able to teach others how to do that,” Friedman said. Thomas Lee, M.D. — Lee was awarded first place in the 2017 Washington, D.C., Dermatology Society Resident Competition for his presentation, “An Unusual Case of Indolent Primary Cutaneous Gamma-Delta T-Cell Lymphoma.” For more information. Elizabeth Robinson, M.D. — Robinson was awarded third place for the 2017 Everett C. Fox Award for her presentation, “Cannabinoid Reduces Inflammatory Cytokines in Dermatomyositis in Vitro.” The award was presented at the American Academy of Dermatology Residents and Fellows Symposium. For more information. In addition to the national and regional awards that the residents have won, the program also boasts several co-branded programs, including “Krazy Kodachromes,” which is a quarterly session published by Derm In-Review and boasts about 500 hits per month.